There are two levels of entry. The first one is a free option and gives you the facility of watching a couple of videos about walking you through the WA approach and getting the most from their excellent platform and the other is how to set up your account and then getting to understand the membership levels. 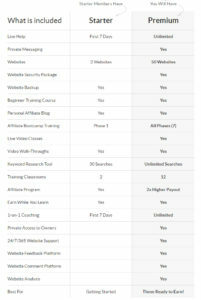 Like everything else the WA hierarchy are encouraging you to join and get access to their vast array of excellent marketing tools with the discreet message that, if you promote their own proven product and get folk to sign on the dotted line for a paid membership then, you can enjoy $87.50 per annum on a starter membership or a whopping $175 on a premium membership for each affiliate sign-up. From an affiliate point of view the potential to make good money is really good if you follow the footpath of the WA school of thought. Even if your average fully-paid up premium affiliate got two sign-ups per month (and that’s very realistic), after the first year they would have 24 folk through their link giving them an impressive $3850 per annum. Can you see why the affiliates of this online business appear on so many of these digital products reviews telling folk of the reasons not to buy said item, whilst telling folk they have a solution for them. It’s the vendors of these products I feel sorry for and I’m surprised they don’t take a harder line on people who try and dominate Google search terms for their items and then pick holes in their products without actually buying it. 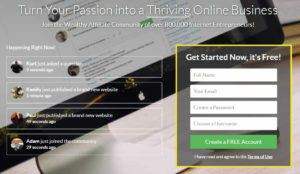 Why wouldn’t the business itself or the affiliate push Wealthy Affiliate in a care-free manner, as it creates a superb income stream and is the nature of this business unfortunately? The problem is that the WA marketplace gets more crowded and further dilutes the potential profits of it’s members. Do the maths folks! If you stay at the free level then, don’t expect much help (if any) after the first week, as the powers that be will probably see you as part of the “something for nothing brigade and you’ll be left to your own devices, as they’re not making any money from you and will eventually see you as a strain on their resources! I’ve looked at a couple of case studies of WA members very carefully before putting my ten pence worth in to this, with one promoting psychical products and the other digital products and I can see how they approach the marketplace and why they must enjoy a fair amount of organic traffic from Google. the WA footpath then, you should enjoy regular affiliate commissions? most likely haven’t bought themselves, with a not so good review and rating and wait for it, offer you something else. Why would you do a detailed 1000+ word review on an item you don’t rate and have limited knowledge of? I see, it’s to rank well for that keyword phrase in Google and the objective to offer an alternative to the product you’re reviewing and guess what that is? Yes, you’ve guessed it correctly – Wealthy Affiliate! Ask yourself this, how many negative digital product reviews have you read that, have been on page one of Google and you think, they seem really honest and then they offer an alternative “bend at the end” which is usually Wealthy Affiliate. Giving in-depth reviews of products in the online marketplace with a healthy ticket price. Coming across to the reader and prospective buyer as an authority figure in that niche by offering quality content, hints and tip guides, lots of related images, You Tube videos. Guess what? The people in this business are really know different to most other marketers in that, they NEVER taken ownership of the vast majority of products they review, but are putting their own spin on it with a lot of content. Aim – To compete well for any related search term with Google. That is how any member of WA will prosper and whilst trying to come across as whiter than white, in essence their approach is very similar to any other marketer out there. What they do take great care in is related and helpful content with superb web templates and leaving a clean online footprint. In order for WA members to survive and make a living they have to compete in Google searches (like the rest of us), it’s as simple as that and they address that by taking the “I’m here to help” approach with their reviews, but really they just want the sale! WA has some great information and tools of which could be useful to folk who are quite new to the online marketplace. They also have a free option which gives newbies the chance for them to dip their toes in the water without any financial risk. The downside is the fact that, you have to pay $49 per month to stay as a full member regardless of your progress and the fact that, you’re reviewing the vast majority of products and/or services you’ve NEVER bought or taken ownership of. For me, this is more than a 3 out of 5, but certainly not a 4. I’m NOT an affiliate of WA and don’t wish to be, but I’m offering an option to join below which I DON’T get any financial reward for. 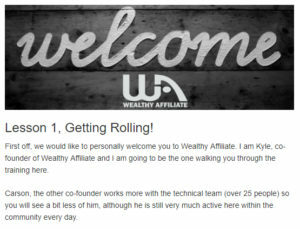 For more information about Wealthy Affiliate click here. This entry was posted in Products and tagged affiliate, honest, review, wealthy by MDB Marketing. Bookmark the permalink.